According to the Canadian Diabetes Association, one in four Canadians has diabetes or prediabetes, and if trends continue, this could rise to one in three. People with origins in South Asia, Southeast Asia, Africa and Latin America have been identified as being at high risk of developing diabetes of living with diabetes. The Canadian Ethnocultural Council received a grant for a for a two-year project, funded by the Public Health Agency of Canada, which focuses on immigrant ethnic populations, especially those who are at risk of diabetes (i.e. South Asian, Southeast Asian, African, including Caribbean, and Latin American). There are two main elements of the project. 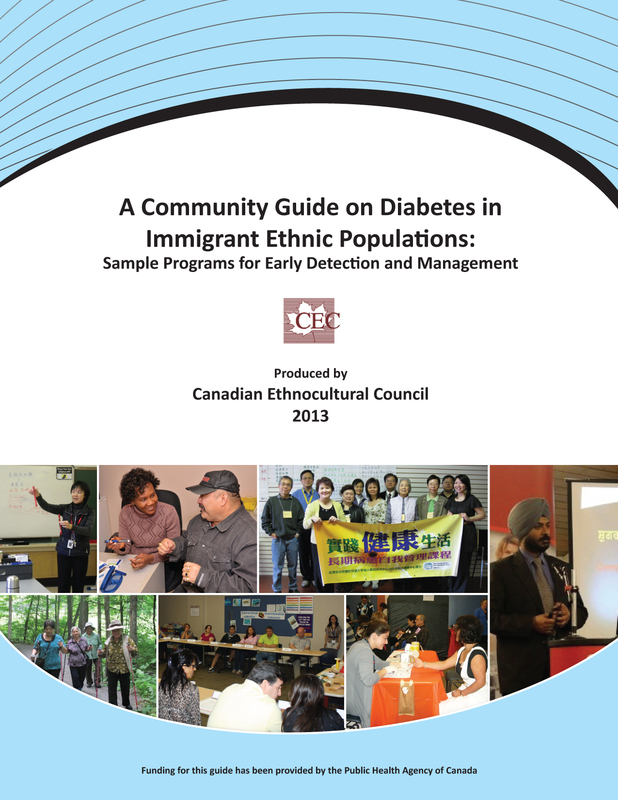 In the first year a "Community Guide on Diabetes in Immigrant Ethnic Populations: Sample Programs for Early Detection and Management" was developed. The second year consists of 18 workshops across Canada in six cities with selected ethnic groups so that they can learn more about the diabetes programs in the ethnic communities and share the content of the guide. The workshops, for healthcare professionals and service providers who work with the high-risk communities, are designed to make them aware of successful diabetes programs for early detection and management. This project, along with our previous health projects, is part of the CEC's overall mandate to strive for equality of opportunity and access for Canada’s ethnocultural populations. CEC’s health projects work to improve population health through increased awareness and understanding of major health issues such as diabetes. As a non-profit coalition of ethnocultural groups, the CEC works with members and partners to accomplish this. For information please contact Sucy Eapen, Project Coordinator, 613.230.3867 ext. 225.